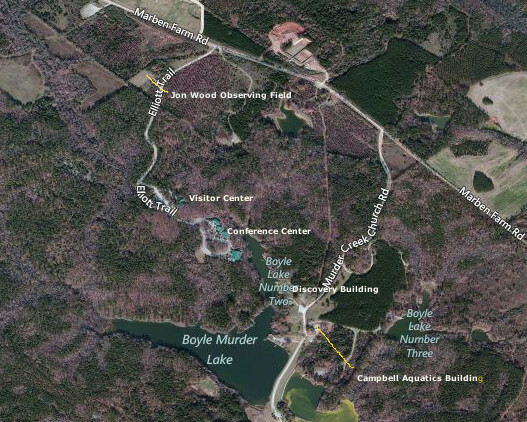 Where are the astronomy activities at Charlie Elliott Wildlife Center? For its quarterly potlucks (March-June-September-December), Charlie Elliott Astronomy usually meets in the Campbell Aquatic Building on Murder Creek Church Road. Charlie Elliott Astronomy usually meets at the Charlie Elliott Wildlife Conference Center on non-potluck nights. Monthly meetings are usually held in either Conference Building “B” or in the Dining Hall, which is the building at the very end of Elliott Trail. Please check the CE Astronomy home page to confirm the location prior to heading out for the meeting – lately our assigned meeting rooms have been moving around a lot! All meetings will be followed by observing on the astronomy field, weather permitting (see below). Please double-check the Charlie Elliott Astronomy home page to confirm the location each month. The Jon Wood Astronomy Field (33.468865, -83.735319) on Elliott Trail is available to the public for observing. Please note that there is a security gate at the beginning of Elliott Trail. The gate opens at 5:00 a.m. and closes at 10 p.m. When leaving, the gate will open automatically as you slowly approach the gate from the inside. If you are a current member of the club and need access during the period when the gate is locked, please contact the Director of CEA. The driveway gate at the field entrance is unlocked at sunset on our monthly public observing nights (weather permitting). Dates of these observing nights are posted on the CE astronomy home page. Regular visitors and users of the observing field are encouraged to join the Charlie Elliott Chapter of the Atlanta Astronomy Club to receive the driveway lock code. From Atlanta, go east on I-20 to Ga. 11 (Exit 98). Turn right (South) and drive 7 miles, to Mansfield. Continue south on GA. 11 for approximately 3 miles to the Charlie Elliott Wildlife Center entrance (left turn). After a few hundred yards, watch for a sign directing you toward the Visitor’s Center (right turn on Elliott Trail). The Astronomy Field driveway will be ~1/3 mile on the right. After reaching the Visitor’s Center, you will find the Conference Center buildings located just down the road as it continues to the right. From Athens, take Hwy. 78 to Monroe, then 11 south through Social Circle and Mansfield. (Alternatively, if you like freeways, you can take 441 to Madison and I-20 west to Exit 98. then turn left to Mansfield). Continue south on GA. 11 for approximately 3 miles south of Mansfield to the Charlie Elliott Wildlife Center entrance (left turn). After a few hundred yards, watch for a sign directing you toward the Visitor’s Center (right turn on Elliott Trail). The Astronomy Field driveway will be ~1/3 mile on the right. After reaching the Visitor’s Center, you will find the Conference Center buildings located just down the road as it continues to the right. Anyone wishing to use the observing field at the Charlie Elliot Wildlife Management Area should be aware that from time to time, there may be hunting activities within the surrounding property. Hunting is permitted on most of the property at certain times during the year from 30 minutes before sunrise until 30 minutes after sunset. It is noted that the Jon Wood Astronomy Field is inside the “Safety Zone” so hunting is not allowed on the observing field. Many game animals are very active during those times near sunrise and sunset, so we should all be aware that our activities like setting up equipment and opening and closing doors and tailgates may disturb the wildlife and those that are there to legally hunt. Please be respectful of hunting activities on the CEWMA property and try and minimize your impact on others. We urge you to visit the DNR’s website for details of the hunting seasons for big game and small game regulations and other details.